WELLINGTON (Reuters) – Britain’s Prince Harry and his wife Meghan braved the rain on a New Zealand beach on Monday for an encounter with a “cheeky” native bird in the picturesque Abel Tasman national park during the final leg of their Pacific tour. The pair spent their second day in New Zealand on the northern tip of the nation’s South Island, having taken a short helicopter flight from Wellington, the capital, where they arrived on Sunday following visits to Australia, Fiji and Tonga. At a beachside campsite, the local iwi, or tribe, welcomed Harry and Meghan with a traditional ceremony accompanied by the blowing of a conch shell. The couple pressed noses with a long line of people in a greeting known as a ‘hongi’. Inside a marquee set up on the grass, Meghan smiled as elder Barney Thomas addressed the couple in the Te Reo Maori language, wishing them “kia kaha”, or strength, for the baby she is expecting next year. Harry struck an upbeat tone despite the drizzly weather, which canceled a tree-planting ceremony. The pair stayed inside the dry marquee for tea and cake with school children. The pair took a stroll on the nearby golden-sand beach, with Harry wearing a black puffer jacket and Meghan in a black Seasalt coat. They came across a weka, a small flightless native bird that ranger Andrew Lamason told the couple is New Zealand’s version of a monkey due to its “cheeky” nature. Saskia Gray, a 16-year-old youth ambassador, said she was impressed by the couple. “They acted very down-to-earth, and they genuinely care about the people and the land,” she said. The royal pair had spent the morning in Wellington discussing mental health issues with members of support groups at a beachside cafe. On Sunday evening, they attended an event to mark the 125th anniversary of women winning the right to vote in New Zealand. Prime Minister Jacinda Ardern told reporters that she had discussed issues related to the Pacific and climate change with the couple on Sunday. 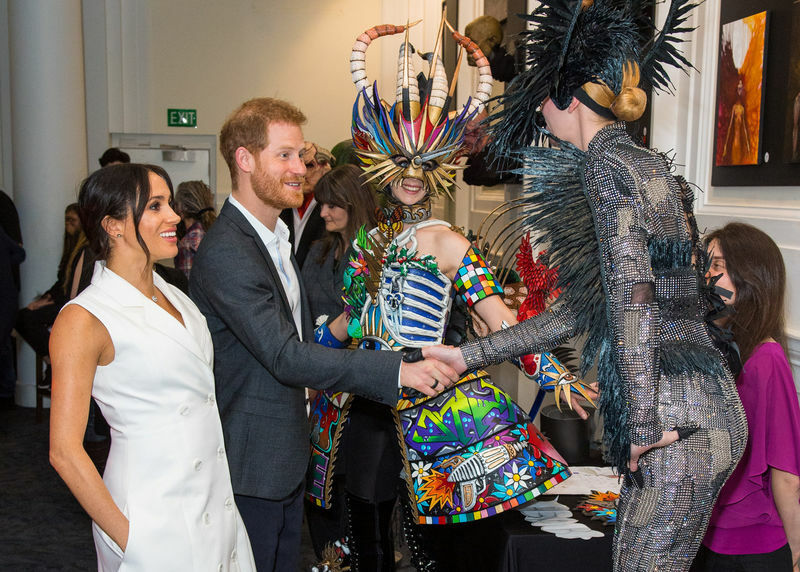 Ardern gave Meghan earrings designed by a local artist in the shape of two feathers, while Harry received an album by New Zealand drum and bass band Shapeshifter.